The Artbox is the smallest box within a PDF file. It covers the area to be used when importing the PDF file into another application. It is comparable to the size specified during the import of an EPS file. The BleedBox is one of the five PDF boxes. It describes the part of the PDF, including the content and the bleeding. In printing a bleed of 1 to 3 mm is usually required. 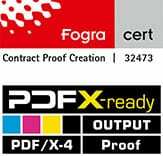 A PDF file with an A4 page for printing so usually has a Trimbox of 210×297 mm, the trimmed page format. The BleedBox has with 3mm bleed around the page the size of 216x303mm. The CropBox is the second largest box of a PDF file. It describes the part of a PDF file which is to be output to a printer or screen. It is often the same as the Mediabox. A RIP is a raster image processor. A RIP is normally understood as a software, sometimes also a hardware or a software / hardware combination, that converts Postscript or PDF data of a page description language into raster points or image files that a “imagesetter” can expose to a plate, film or a proof output.